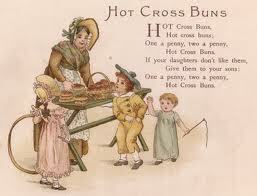 Easter is coming so the Hot Cross Buns are too! Easter comes early this year. Yes, yet another calendar event for March. March must be feeling pretty good about herself this year, eh? I always pictured March as female. She will never get Halloween or Christmas but Easter and St. Patrick’s Day are pretty good gigs. But let’s talk about the food. We’ve done the Irish Cream Cheesecakes and the sandwiches to honor Mr. Caesar. What’s next is a traditional bakery favorite – Hot Cross Buns. We’ve been told the ones we make are the best that they have ever eaten. And they are right! The ones we make are about 1000x better than the ones that you will ever get at a supermarketgrocerystoreemporiumcostcowalthing- markettableallechantekingarthurlousandeveryotherbakeryinnewengland place. We start selling them on Tuesday, March 26 and will be selling them all through the week leading up to Easter. ( we will be closed Easter Sunday, by the way) And our best wishes to the new Pope! Meet the new boss, hope he’s different than the old boss.